These Lure Hair Thinning Shears are made of two materials – their handle is made of ultra-weight aluminum which makes them lightweight and easy to use, but their blades are made of hardened high quality stainless steel which ensures their durability and long-lasting sharpness. As they are intended for hair thinning, they have two kinds of blades – one blade is convex hollow ground blade, but other blade has 23 serrated micro-teeth. Combination of these two extra sharp blades ensure smooth and accurate cut. Length of this Lure product is 5.5 inches, but its weight is 1.6 ounces. These Lure hair thinning scissors have tension adjustment option which is provided by customizable tension screw, therefore, they can be customized for every barber’s individual needs and wants. They also have removable finger rest, but it is recommended to use it, because it not only improves comfort and ergonomics of work, but also prevents discomfort and thus injuries of hands. 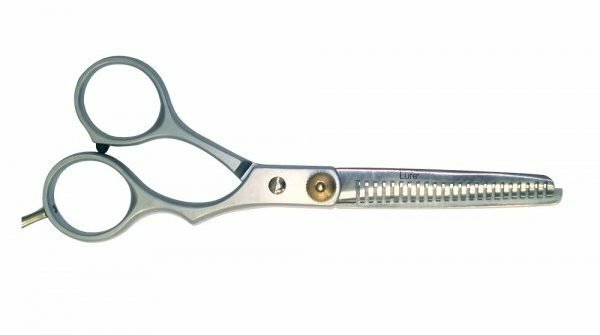 Unfortunately, these Lure thinning shears do not have finger inserts for finger rings which usually help to enhance fit and thus comfort. Another feature of this product is cushioned stopper between finger rings which ensure balanced and controlled, as well as silent hair cutting. It should be mentioned, that these Lure scissors do not come with any storage case, therefore, if you need some case for your tools, you have to buy it separately. As these Lure hair thinning shears are made of two materials, color of their parts differs, for example, their aluminum handle is light gray, but their stainless steel blades are dark gray. They also have golden plated tension adjustment screw which contrasts with silver color elements. Another design elements of this Lure product is curved shin which adds elegance and style. These Lure hair thinning scissors are professional grade hair thinning scissors, so they can be used both by professional hairdressers and hairdressing amateurs. They possess all the necessary qualities and their price is affordable for students and amateurs as well. These Lure Hair Thinning Shears are made of stainless steel and aluminum, and they have two kinds of blades – convex hollow ground and 23 serrated micro-teeth blades. Their length is 5.5 inches and their weight is 1.6 ounces. As they are made of stainless steel and aluminum, color of their parts differs – aluminum handle is light gray, but stainless steel blades are dark gray. This Lure product has golden plated tension adjustment screw, removable finger rest and cushioned stopper, but it does not have finger inserts and storage case. 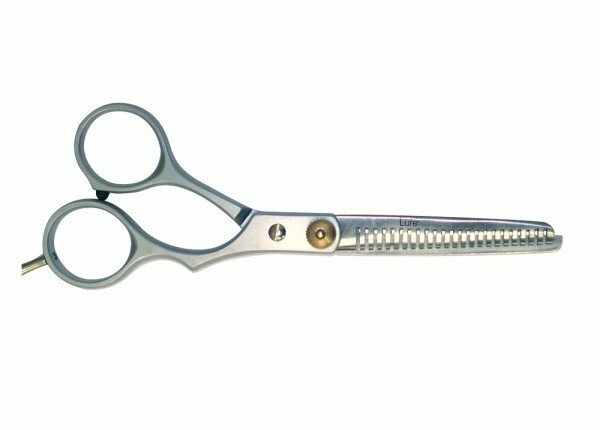 Both professional barbers and hairdressing students can thin the hair with these shears.